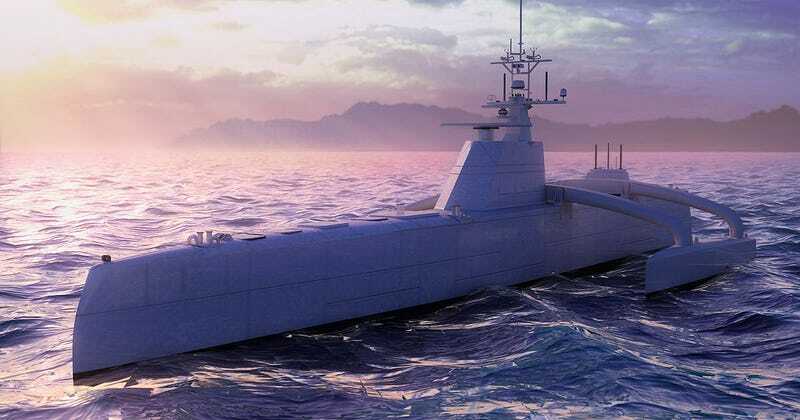 In 2010, DARPA announced that it wanted to create a surface dwelling unmanned sub hunter stalker, otherwise known as the Anti-Submarine Warfare Continuous Trail Unmanned Vessel, or ACTUV for short. Fast forward five years and the prototype is about to set sail. What comes next could be a revolution in naval warfare. There is no doubt about it: the US Navy has a big problem with small and relatively cheap submarines. China in particular has a rapidly expanding sub fleet, while Russia continues to slowly revamp theirs. Meanwhile, Air Independent Propulsion (AIP) technology (read all about it here) has allowed foreign nations to field relatively inexpensive and extremely silent diesel submarines. This gives even bad actors that were once economically and technologically limited to fielding standard diesel submarines that need to surface regularly to recharge their batteries a near-nuclear submarine-like capability; these subs can stay submerged for weeks at a time and are very hard to detect and track. AIP diesel submarines are a 75% solution at 20% of the cost and are ideally suited for regional powers with anti-access ambitions. Diesel subs with AIP technology have more advantages than just cost over their much more complex and expensive nuclear counterparts. Their relative simplicity and reduced need for complex infrastructure actually makes them harder to predict in many cases. They can prowl shallow water environments with relative ease and are also quieter than many foreign nuclear designs. Even their size may begin to grow to proportions that could eclipse that of smaller nuclear Fast Attack submarines. All this adds up to a very bad equation for American and allied submarine forces already experiencing a deficit when it comes to being able to meet tasking demands. American nuclear Fast Attack submarines will have to deal with a resurgent Russian Navy and a growing fleet of Chinese nuclear ballistic missile submarines in coming decades, which will result only in an increase in this deficit. On top of those issues, as the AIP diesel submarine craze grows and the technology becomes even cheaper and more accessible, there will be more undersea ‘targets’ to keep track of. Russia’s Lada Class is being exported as the Amur Class and has AIP technology as an option. Although the Navy has tried to adapt to these emerging threats, its efforts have been largely unsuccessful, and war games still show how even a lone AIP-capable diesel submarine, or even old Nuclear submarines, can sink a US Super Carrier surrounded by the world’s densest and most advanced anti-submarine screening capabilities. Shallow water regions with complex littorals only complicate a sub hunting effort, and even though a submarine may be detected one moment, it could slip away the next. The best asset a carrier group has in dealing with such issues is its assigned Fast Attack submarine, although just one or two of these nuclear subs cannot deal with multiple AIP diesel threats operating in multiple locations around the carrier strike group. Once again, tactical demand could easily outweigh tactical supply when confronting a savvy or well-equipped enemy. As US Navy commanders continue to struggle to keep pace with the retirement of older submarines, there is a great need for a new way of tracking enemy subs. Even if the threat of diesel submarines alone were lessened, it would be a game changer for US Navy and our allies’ subsurface resource management conundrums. If such a solution were far cheaper than simply building more multi-billion dollar nuclear Fast Attack submarines, all the better. Enter DARPA, Office of Naval Research and Leidos Labs ACTUV concept, a possible solution for persistently tracking enemy submarines, especially the diesel AIP kind, with maximum affordability in mind. Sea Hunter will be a trimaran design, with the vast majority of its hull and superstructure built of lightweight and radar-translucent carbon-composite materials. It will have a length of around 130 feet and its center hull will be long and streamlined. The trimaran design lends itself to endurance, sea keeping, and speed, which will be necessary for keeping up with sprinting diesel submarines as well as those that are running slow and quiet for long periods of time. The first ACTUV prototype, named Sea Hunter, is currently under construction at Oregon Iron Works and will be tested on the Columbia River later this year. Oregon Iron Works have become something of a Scaled Composites-like boutique manufacturing house for exotic, experimental and stealthy naval vessels. The unmanned, unarmed, and highly autonomous ship’s design is largely based around a series of plug-and-play modular components, allowing the vessel to be reconfigured for different missions with relative ease. Periphery sensors will include multiple types of radar, electro-opitcal systems for viewing the ship’s surroundings in day and night, and electronic support measures used to sniff out enemy radio and sensor transmissions. The Sea Hunter’s most potent sensors will be its mid-frequency sonar, built into a bulbous enclosure that juts out below the ship’s keel, used for locating undersea targets at longer ranges while its high-frequency active sonars, mounted in small protrusions below its main hull, will better refine tracking and make it extremely hard for the object being pursued to slip away. These high-frequency sonar systems will also be able take a synthetic ‘picture’ of the sub’s target so that Sea Hunter’s computers can help classify and identify it by comparing the target to images and sound signatures stored in its memory banks. From there, on-board automation helps predict what the target will do next and will send updates to controllers thousands of miles away when the target does something of significance or when it observes something in its area worth noting. Aside from its on-board tracking sensors, the most important electronics suite aboard Sea Hunter will be its satellite and line-of-sight data-links that provide situational awareness to controllers thousands of miles away, as well as connectivity with other sub hunting assets. These include Sea Hunter’s high and long flying semi-autonomous cousin, the Navy’s new MQ-4C Triton, as well as sonobuoy dropping P-8A Poseidon maritime patrol aircraft and MH-60R Seahawk helicopters. More generally speaking, Sea Hunter will go about its mission by heading to sea and searching for underwater contacts autonomously. Once it has found something or is directed to a contact by another asset nearby, it will sprint to that location and attempt to lock onto the submerged contact with its on-board sensors by continuously pinging that same contact with active sonar while using other sensors to collect data on it. Once its high-frequency sonar has the target in its sights, the only way to break its lock would be by somehow eluding using decoys or other tactics, both of which Sea Hunter will be programmed to notice and disregard, or by outright destroying it. Think of it as the Navy’s pitbull, once it latches on it you may have to kill it before it lets go. Currently, keeping track of these submarines takes either a nuclear Fast Attack submarine and/or a whole slew of assets that have to keep up with it over time. There is already a submarine tasking deficit in the US Navy, and eventually, there may be far too many of these cheap submarines to attempt to track with nuclear submarines, even in areas where US Carrier Strike Groups are present. And since the Navy will not get off its high horse and build modern AIP diesel subs for itself, even for geographical locations like the Persian Gulf where they really could use them, they are looking for solutions to cost-balance the diesel sub tracking mission. The Navy hopes Sea Hunter is that solution. Its mission may be nearly parasitic in nature, and it certainly isn’t as glamorous as a full-force sub hunt, but it does make sense economically. Freeing up multi-billion dollar nuclear submarines and surface combatants for other tasks in a shrinking Navy that has more missions that ever before is an enticing proposition. Some estimates have said that ACTUV could provide a 1-to-10 cost ratio as a countermeasure for diesel submarines. Meaning that if a diesel submarine costs $400M, a operational Sea Hunter should aim for a cost around $40M each. This turns the sub tracking cost equation on its head. Further tests will bring tactical scenarios into the mix, including simulating enemy surface obstructions even while ACTUV is trying to track a submarine. Its navigation system will also evolve, presumably with an extra layer of close-range electro-optical and lidar and/or laser sensors to back up its radar picture for evasive maneuvering and identifying between friendly and enemy surface ships nearby. Eventually, even virtual operator control may be possible on remote craft like Sea Hunter, as spherical camera systems already exist for sea-going vessels (particularly one based on the F-35's promising Distributed Aperture System, otherwise known as DAS). With enough communications bandwidth available, an operator could one day put on a set of virtual reality goggles and actively see what is surrounding Sea Hunter in real-time, with even better fidelity than if they were physically standing on the ship’s bridge. Additionally, they would have the ability to see in other spectra than just visible light and would be able to look through the structure of the ship itself. You can read more about this game-changing technology by clicking here. It is obvious that ACTUV has a fairly focused purpose: persistent tracking of submarines, especially diesel electric ones equipped with AIP technology, with hopes of making such a deadly and proliferate technology useless one day. Yet the program’s potential implications are even wider-ranging. Much like semi-autonomous unmanned systems today, some of which have been in development for over a decade and at great cost, ACTUV’s successors could solve so many more problems than were originally intended with the baseline technology. ACTUV is like the Global Hawk of unmanned surface vehicles. Eventually, its autonomy could lead to much more advanced unmanned craft that take on many different roles. For instance, Sea Hunter’s grandchildren could one day travel the oceans for months on end surveying atmospheric and ocean conditions, or studying populations of fish or even shadowing whales and sharks for scientific purposes. On a larger scale, one day commercial ships could have similar autonomous navigational systems as those developed for Sea Hunter, potentially paving the way for widespread low-manned or even unmanned shipping operations. This would be especially beneficial if all ships over a certain sized were outfitted with data links so that collisions were nearly impossible, especially if other layers of on-board sensors for avoidance were added as the technology matures. On a military level, evolution of Sea Hunter could help support the Navy’s rocky minimally crewed model for future ship designs. A swarm of Sea Hunter-like vessels could one day accompany US Navy Carrier Strike groups, constantly prowling the waters for thousands of square miles around the flotilla, surveying the world above and below them. Even more exciting, or controversial, depending on how you look at it, autonomous vessels could be ordered to do different missions by commanders, including surface bombardment, launching special forces, surveillance, search-and-rescue, or even air defense. Even ordering over-the-horizon swarming attacks on enemy surface combatants is within the realm of possibility today, and will most likely be a given capability tomorrow. The idea of arsenal ships, full of weaponry such as cruise missiles that are closely ‘tethered’ via data-link to major surface combatants, could become a more affordable capability if they were largely unmanned. A fleet of autonomous ships like Sea Hunter could efficiently guard the entrances to major waterways and ports, acting as early warning sentinels for unannounced underwater and surface activity. Finally, we may find our submarines themselves going unmanned one day as well, roaming the depths for months on end, looking for and hunting other unmanned and manned submarines. It’s the ultimate robotic game of cat and mouse, with patrols lasting years and the ability to track other subs for months on end. When it comes to the rapidly-evolving landscape of anti-submarine warfare, a combat capability that costs vast amounts of money and requires outside-the-box thinking to stay on the cutting edge, Sea Hunter could be just the solution the Navy desperately needs to combat the rise of diesel AIP subs, especially if the Navy will not build their own AIP submarines. Yet Sea Hunter’s potential is much larger than the sum of its parts or its mission description. Considering how much money is being invested in unmanned aircraft capabilities, DARPA’s pit bull-like sub hunting robot is a relatively humble investment in future unmanned surface warfare technology.